Finance is all about the figures. But, piecing together data from different systems and spreadsheets often makes routine reporting difficult, slow and inefficient to compile – let alone strategic planning, budgeting and forecasting. Imagine if you could instantly visualize all your financial data in one place and monitor performance at-a-glance. 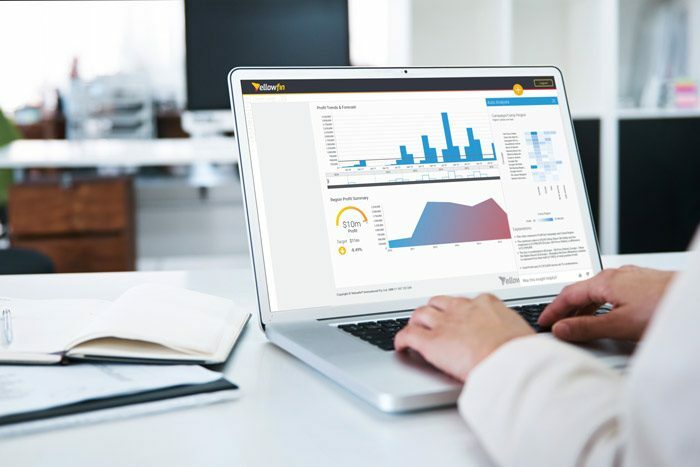 Yellowfin delivers the real-time insights and robust security you need to track, analyze and act on the financial KPIs important to your business – all with a few simple clicks. Identify trends in revenue, assess growth, perform cost analysis, manage expenses and assets. Even determine profitability by business unit, product or region. Monitor working capital and operating cash flow, assess your debt to equity ratio, or compare accounts payable to accounts receivable. Easily track gross and net profit margins to achieve big returns by making small adjustments. See how you can improve the financial health of your organization with Yellowfin.